In some cultures, it’s bad luck to get married in the same year as your sibling – but not the case for two sisters I had the pleasure of coordinating for this past season. In fact they embraced it! As the eldest child myself, I think it is a common trait to be protective over younger siblings, and the same rang true for Tammy and Kerry. Tammy was first to walk down the aisle in April of this past year. She said the process of planning her wedding served as a sort of trial run for younger sister Kerry whom she could then guide with fresh advice and knowledge from her experience of just a few short months ago. I came into the picture for both gals with the understanding that, above all else, they wanted the little details taken care of so that most importantly “they” (these lovely sister/brides!) could be fully present to enjoy those oh-so-important wedding day moments. One of my favourite introductory questions to ask a couple is “How and where did you two meet?”. It’s a great way to break the ice and learn about those you will be spending the next year planning alongside - and I always enjoy the answers as no two stories are the same. For Kerry and Tom, their romantic roots were planted in secondary school – yes they’re high school sweethearts – which meant that their September 2018 wedding had been 14 years in the making. Kerry and Tom are the definition of laid back – but they were not at all lacking in dedication to making this the wedding of their dreams. 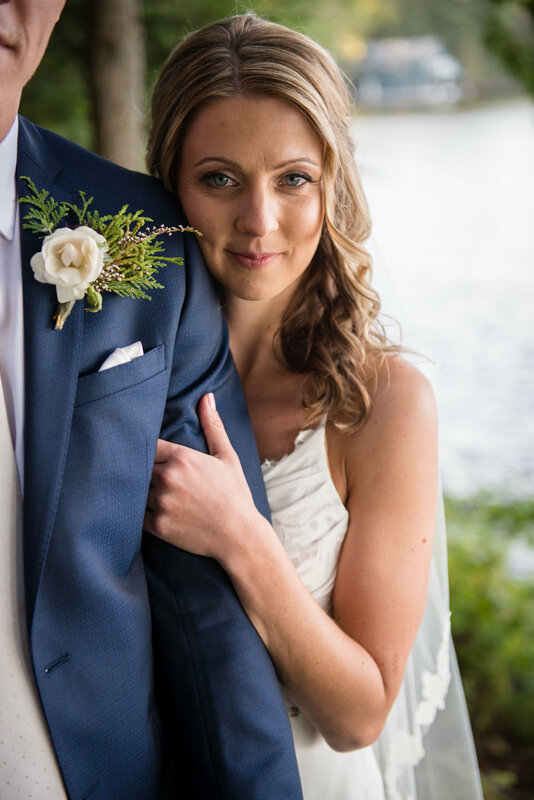 Exercising simplicity at its best, they didn’t get caught up in any overwhelming details or decisions, making their venue location an easy choice – the cottage! Kerry’s family has a property in beautiful Port Carling, situated on the picturesque Lake Rosseau. Guests would be invited to enjoy the comforts of the cottage where this lovely couple had the joy of growing up with. It also just happens to be the location where Tom popped the question the summer prior, so it made perfect sense that the next chapter of their story would begin there as well. Nothing says cottage country like the offerings of Muskoka - including the inevitable impact of Mother Nature. A storm hit the night prior to the wedding, causing several power outages across the region - wedding venue included. It took a few quick phone calls between myself and the caterer the morning of the wedding to secure a backup generator, additional lighting and extension cords to ensure the show could go on, and boy did it ever! Angela and her team at Cravings Fine Food were my behind the scene dream team. The groom made a stylish entrance by boat, where guests awaited his arrival as he then climbed a mere 74 steps “up” from the dock. Yes, that is right, UP. Don’t worry… the view was well worth the trek! 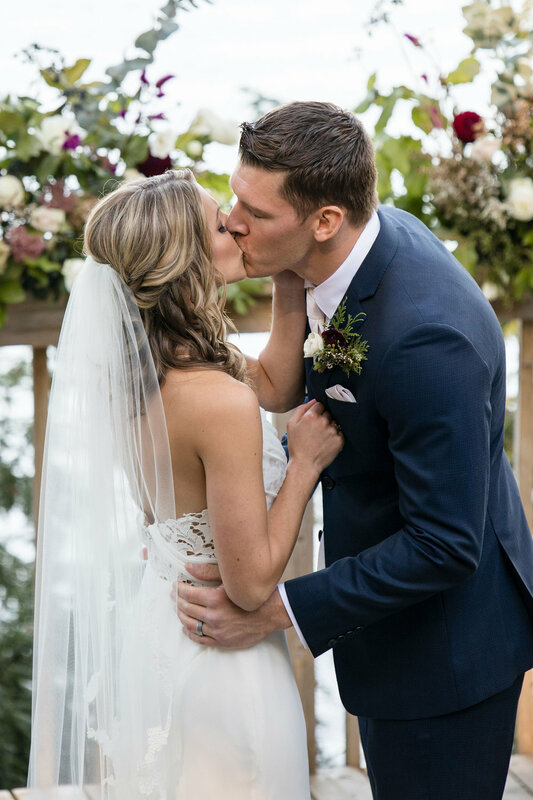 The ceremony was simple, yet stunning – two lush floral arrangements would frame the altar in which the couple would exchange vows, enhancing the natural setting in which they chose to embrace. Following the I do’s, guests were greeted with a champagne toast and some mouth-watering canapes while family photos were taken around the property. 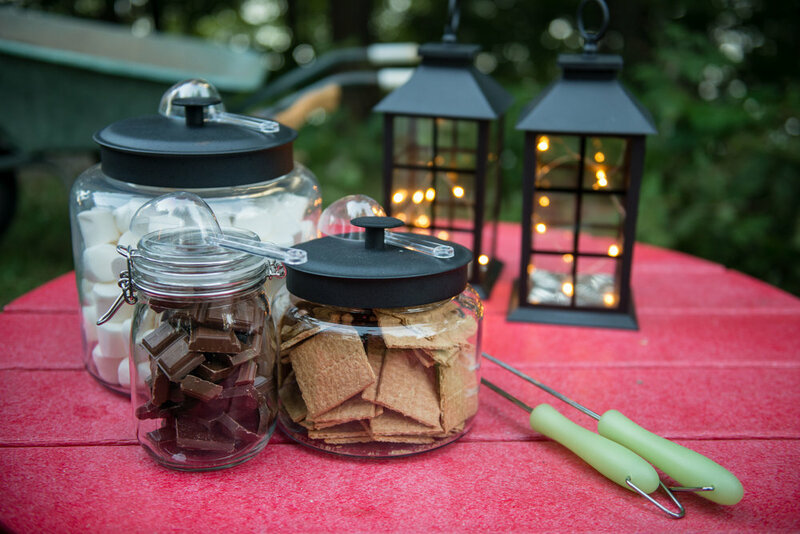 Quintessential cottage touches could be found throughout the reception; throw blankets, card games, strung lighting, over-sized lanterns, Muskoka chairs and bug spray. One particularly special touch was the guest favours - hand knit dish cloths in the couples chosen wedding colours, carefully crafted by the bride and her grandmother (aka GMA) over the months leading up to the wedding. The main house was utilized for casual seating. Simple folding chairs would circle a few strategically placed dining tables, giving guests the option to sit if they wished, however mingling was encouraged. A nearby screened-in porch offered an assortment of “cocktail” style food, filling the cottage with heavenly aromas. Guests helped themselves while periodically joining the group outside where speeches and first dances were organized from the base of the deck. The evening offered classic cottage tunes, a late night pretzel station, which of course was a crowd-pleaser (pretzels..another cottage classic), signature drinks flowing from the patio bar, and a close-by fire pit provided warmth to the late September chill in the air. Kerry would say her favourite moment of the day was finally seeing her groom after literally hiding from him all morning. With the power outage, the bride and groom needed unexpectedly - and strategically! - to utilize the same space without seeing one another. And they pulled it off victoriously, remaining concealed from one another until the ceremony. 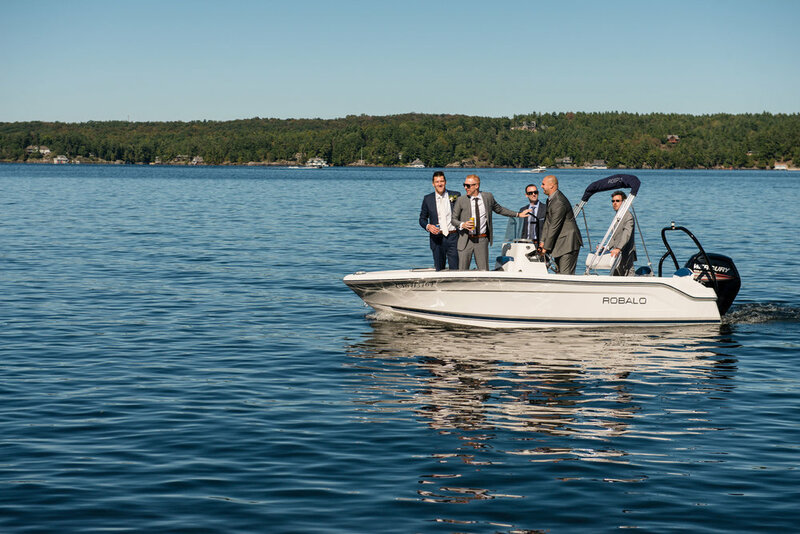 Tom would say his favourite moment was of course seeing his beautiful bride.. but a very close runner up was the unexpected speed boat race happening on the lake behind them during their ceremony. A panic moment for some, but not for these two. It was all just part of the cottage wedding experience. From a like-minded cottage enthusiast… Cheers to a beautiful life together, and of course, the cottage life!